For those of us who enjoy an occasional drinking game, there’s nothing better than finding something new to enjoy. Sure, the standard game of Beer Pong or King’s Cup will always be the most popular option in a crowd, but presenting your friends with a new game can add another dimension to your party experience. And sometimes the best place to look for a fun new drinking game is popular board and card games that already exist. Specifically, it’s remarkable that more people don’t turn Texas Hold’Em into a drinking game, given the wild popularity of this particular type of poker. We frequently see Texas Hold’Em tournaments on ESPN and other forms of poker are significantly lesser known, so why not drink to the most popular card game out there? 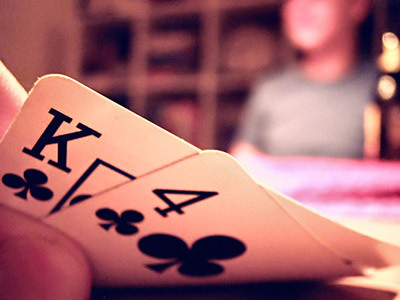 If this idea sounds fun, here are a few tips for working out a Texas Hold’Em drinking game. Know The Ordinary Rules – Nothing is worse than sitting down with friends to play Texas Hold’Em and then figuring out none of you actually knows the full range of rules and terms. Online poker site Betfair features a how-to-play page for Texas Hold’Em that’s a solid reference, because it explains betting intervals, blinds, dealing, etc. It’s not uncommon to feel confident about these rules until you actually have to run a game and then realize there’s more to learn, so a resource like this can be crucial. Use Chips – Before you start working on currency (as in, what each bet is worth in drinks), get your chips handy. There’s always a temptation to do betting verbally (as in, “I bet one 1 on this hand”), but this quickly gets confusing and cluttered. Make sure you have chips on hand, and then simply assign them values in drinks. Assign Value – This is where your own creativity comes into play. Drinkswap has a few suggestions, such as one beer being equal to 20 seconds. With this sort of format, you can have chips worth values of 5, 10, 15 seconds etc. and bet accordingly, with the loser of a hand drinking for the seconds he or she lost. Another option is to take a power hour approach and make chips worth shot glasses full of beer. Know Your Limits – This is just a reminder that assigning seconds quickly adds up to several drinks per game. Know your limits when you’re assigning value. All-in = chugging, if you lose. This should be a rule in any Texas Hold’Em drinking game! Ultimately it’s pretty simple, but again, it’s surprising how few drinking game enthusiasts have tried Texas Hold’Em with beer. Give it a shot, and you’ll probably have a new game among your favorites.